In this tutorial, we are going to look at Angular Components. We will look at the building blocks of the component and the important metadata properties of Components like selector, template, styleURL etc. We also show you how to create a simple component in Angular. The Component is the main building block of an Angular Application. The component contains the data & user interaction logic that defines how the View looks and behaves. 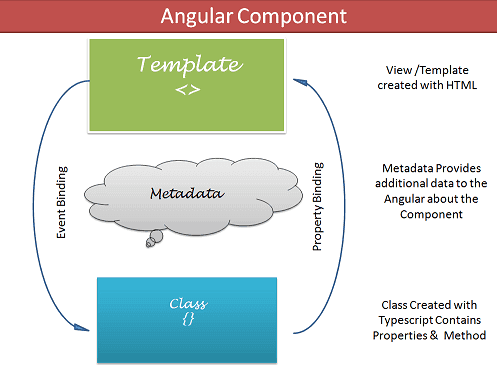 A view in Angular refers to a template (HTML). The Component is responsible to provide the data to the view. The Angular does this by using data binding to get the data from the Component to the View. This is done using the special HTML markup knows as the Angular Template Syntax. The Component can also get notified when the View Changes. The template defines the Layout of the View and defines what is rendered on the page. Without the template, there is nothing for Angular to render to the DOM. The Templates are created with HTML. You can add Angular directives and bindings on the template. There are two ways you can specify the Template in Angular. The Properties of a class can be bind to the view using Data Binding. The Component classes in Angular are prefixed with the name “Component”, To easily identify them. Metadata Provides additional information about the component to the Angular. Angular uses this information to process the class. The Metadata is defined with a decorator. Selector specifies the simple CSS selector, where our view representing the component is placed by the Angular. The Providers are the services, that our component going to use. The Services provide service to the Components or to the other Services. The directives that this component going to use are listed here. We have already shown how to create the Angular Application using Angular CLI in how to create first Angular application tutorial. The Angular CLI has automatically created the root component app.component.ts. The Component app.component.ts. is already been created for us by Angular CLI under the folder src. By Convention, the file name starts with the feature name (app) and then followed by the type of class (component). These are separated by a dot. The extension used is ts indicating that this is a typescript module file. In the above example, we have used external template using templateUrl metadata. The templateUrl points to the external HTML file app.component.html. The Angular knows which template display, using the templateUrl meta data, which points to app.component.html. By Convention, the file is named after the component file it is bound to with HTML extension. Note that title inside the double curly bracket. When rendering the view, the Angular looks for title Property in our component and binds the property to our view. This is called data binding. Note that styleUrls meta data can accept multiple CSS Files. The Angular Module organizes the components, directives, pipes and services that are related and arrange them into cohesive blocks of functionality. We use @NgModule class decorator to define a Module and provide metadata about the Modules. We add all the components, pipes and directives that are part of this module to the declarations array. We add all the other modules that are used by this module to imports array. We include the services in the providers array. The Component that angular should load, when the app.module is loaded is assigned to bootstrap property. and then added to the declarations array. In the above example, we have used the external template & Styles. We can also specify the Template, Styles inline using the template and styles property of @Component metadata as shown below. The Template can get pretty long. In the case of Multi-line template, you can use BackTicks ( ` ) to enclose the template string. Specifying the Templates and styles inline has few disadvantageous. The Template can get pretty big and clutter your code. You will also not get the IntelliSense help while editing the template. In such a case you can write your Html template in an external file and link that file in your component code. When we build Angular Components, we are actually building new HTML elements. We specify the name of the HTML element in the selector property of the component metadata. And then we use it in our HTML. The Angular, when instantiating the component, searches for the selector in the HTML file and renders the Template associated with the component.